Green Horizons is a unique house set in six acres of beautiful park and woodland on the edge of Puivert village in Occitanie, South of France. Our self-contained apartment is bright and spacious, with its own private terrace and garden. You will have access to our outdoor swimming pool, which will be shared with our other guests. The apartment is ideal for couples on a romantic break, or a family with a child. Double bedroom with ensuite bathroom. The open-plan living room has a well-equipped kitchen corner, a dining area overlooking the garden, and a comfortable lounge area with satellite TV and a DVD player, as well as an easily-converted day bed. The bathroom has a rainforest shower, and is equipped with hair-dryer, towels and toiletries. We can provide you with a travel cot and baby bath, or addition beds on request. You will have your own private entrance with drive and parking space. The apartment is fully accessible for people with restricted mobility. Free Wi-Fi is available. Enjoy a meal or a barbecue on your own sunny terrace with a view of the pool, or relax in the private studio garden. Steps lead down to the beautiful pool (open from mid-May to mid-October) and the pool-house, which you will share with a small number of other guests; you are welcome to explore and relax in the lovely grounds where you will find a children’s play area, picnic tables and hammocks. The studio apartment is self-catering: the boulangerie in Chalabre has freshly-baked bread, croissants and cakes; fetch milk from the nearby farm after milking in the evenings; visit the local brewery; fill a “cubi” with wine from the organic vineyard; shop in nearby markets for seasonal fruits and vegetables. For a break from cooking, Puivert village also offers a range of restaurants, bars and cafés around the lake in season, or Chalabre (10 minutes’ drive or 20 minutes by bike) has bars and restaurants all year round. You are welcome to store your bicycles safely in our rainproof barn. Clothes washing and drying facilities are available on request. Green Horizons offers you a welcoming and peaceful place to stay in a beautiful area. Puivert village, swimming lake and beach, castle and museum are in easy walking distance. In July and August there are weekly night markets by the lake with live music and street food. The Languedoc, in the foothills of the Pyrenees, is one of the sunniest regions of France, with over 200 days of sunshine a year. The Mediterranean cost about 90 minutes’ drive. With its organic vineyards, Cathar castles, and colourful local markets the area offers something for everyone. Lac de Montbel, the largest watersports lake in the South of France, is 15 minutes’ drive or 30 minutes by bike. The cinema is 20 minutes’ drive away, and nearby towns offer a range of activities and events during the summer months. The large bathroom has a walk-in rainforest shower and heated towel rail, and is equipped with a hairdryer, towels and toiletries. There is an air-conditioning unit in the bedroom, which can also be used for heating in cooler weather. Electric heating throughout. The bathroom has a heated towel rail. The studio has a large, bright living area, with big windows overlooking the garden. Blinds and roof-shutters provide privacy when required. The kitchen area is equipped with gas hobs and an oven, fridge/freezer, sink, space for food preparation and plentiful cupboards. All eating and cooking utensils are provided. A small library of books to borrow or swap is available in the main house. The studio has it's own small garden with a path leading down to the pool. The pretty private terrace has views of the garden and pool, and a table and chairs for you to enjoy drinks and meals outside. The Studio apartment is all on one level, with large sliding doors to the terrace and private parking area. The bathroom is not specially adapted for wheelchair users, but is easy to access with only a small step up to the shower. You are welcome to share the lovely pool in season, with a small number of other guests. There are plenty of pool loungers and a pool-house with barbeque. Nous avons passé un séjour de quatre nuits en couple avec notre bébé dans un cadre parfaitement calme. Ruth et Peter ont été très discrets, sympathiques et soucieux de notre bien-être . Nous reviendrons sans hésitation l'été prochain. Le rapport qualité/prix est excellent. Merci pour votre avis. C'était un grand plaisir de fair votre connaissance. Nous sommes très heureux que vous avez si bien apprécié un séjour calme chez nous, et nous serions bien heureux de vous accueillir ici une autre fois. un havre de paix dans un cocon verdoyant dans le pays cathare. Quel cadre et prestations hors du commun!!! !, le domaine de Green horizons est très accueillant. 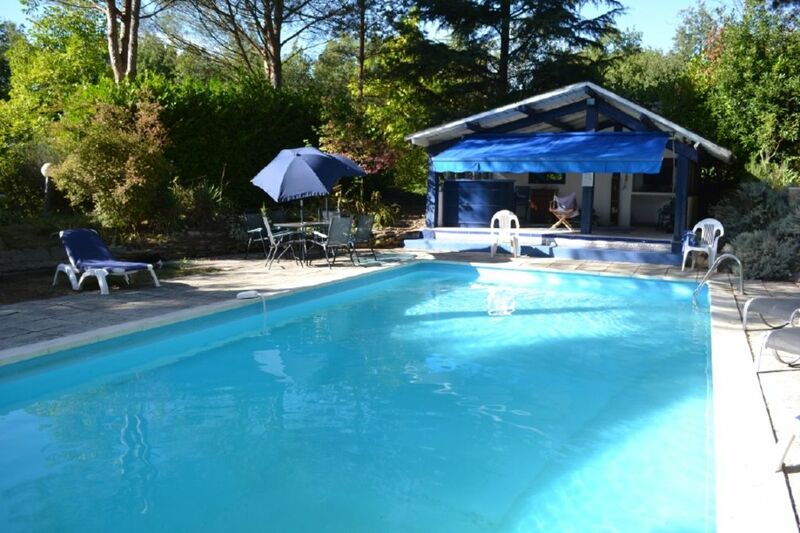 Les propriétaires sont gentilles et discrets.Pour la baignade: agréable piscine dans le domaine ou lac au pied du village et du château de Puivert. Les enfants ont été conquis, nous aussi!!! Puivert is a pretty village in the foothills of the Pyrenees. It has a swimming lake with sandy beach, a Cathar castle and museum, cafes and restaurants. In summer there are cafes and bars around the lake, and regular night markets with live music. The Languedoc, in the foothills of the Pyrenees, is one of the sunniest regions of France, with over 200 days of sunshine a year. Popular with hikers, cyclists and watersports enthusiasts, it is close to the mountains for hiking and stunning views and to the Mediterranean sea. Minimum rental is 3 nights. Minimum notice for booking is 1 day.